When the boys were newborns, I can remember going in repeatedly to check on them and see how they were doing, and even this third time I have a feeling it’ll be the same way! We didn’t have a video monitor before, but our good friends have one and we saw how useful they can be, so we knew we wanted one for this baby. With two “not-good-at-inside-voices” little boys, I figure this baby will be napping in the other room, so having the video monitor to check on her will be great! You can also see in the shot that the monitor also tracks the room temperature. I never would’ve thought about wanting this feature, but it’s really nice for being able to make sure the room isn’t too cold or warm. You can even set it to be alerted if the temperature reaches a certain minimum or maximum temp. You can also turn the sound on or off – if it’s off, there’s a vibrate feature to the device to still alert you if your baby cries. 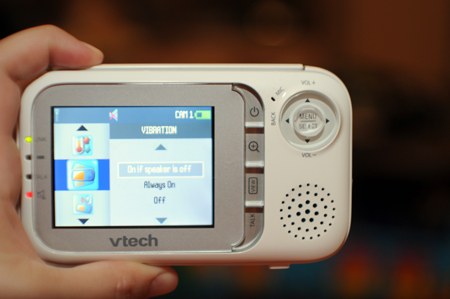 You can also push the “talk” button to soothe your baby remotely. I can imagine using this if you want to offer them comfort without going into the room and waking them up or upsetting them. 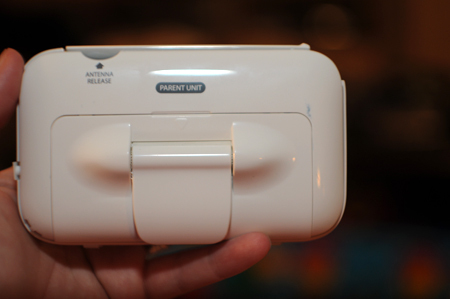 The parent unit has a rechargeable battery and lets you know when the battery is getting low. It’s also got a clip to make it easy to stick on your pocket – or you can fold the clip out to use as a stand. The camera can run on 4 AA batteries, or (as recommended) with the plug. You can also use up to four cameras with this system – a great feature to get different angles of the room or check on more than one child. 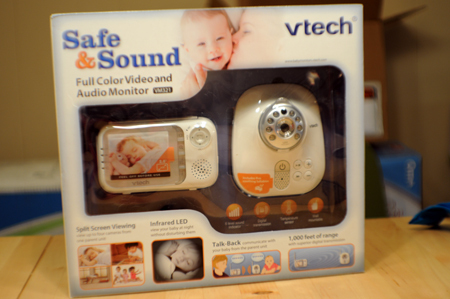 The VTech Safe & Sound monitor retails for $129.95. It’s available in many retail stores and on Amazon.com. It’s less expensive than many other monitors on the market, and I love all of the features it offers. We’re excited to have this for keeping an eye (and ear!) 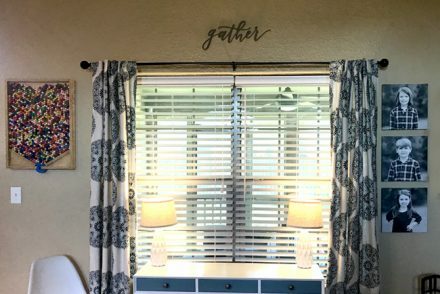 on our newest addition once she arrives! 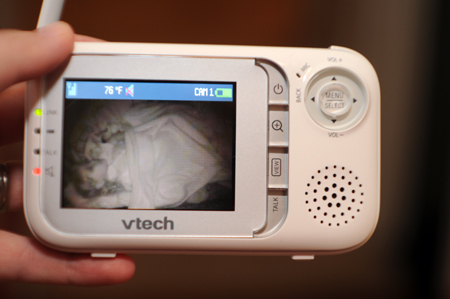 Note: I received the VTech Safe & Sound Audio & Video monitor to facilitate this review. I was not compensated monetarily for this post. All opinions are honest and my own.